We concluded the year 2018 with a launch of the ‘Do The Right Thing’ Campaign which embodies our operational guidelines in key decision making processes based on Transparency and Accountability without compromising on service delivery and operational efficiencies. This campaign spells out three key steps that each Agency staff would be required to take in arriving at a pertinent decision in his or her course of duty, with the starting point being to undertake any assignment with a clear conscious as long as he or she is allowed to do so. Secondly, if however, employees are not clear that the intended action is within laid down procedures and regulatory framework, they are advised to hold on and consult, and finally not to proceed with any action if, to the best of their knowledge and understanding, the intended action is not in the best interest of the NRFA, or indeed the nation. 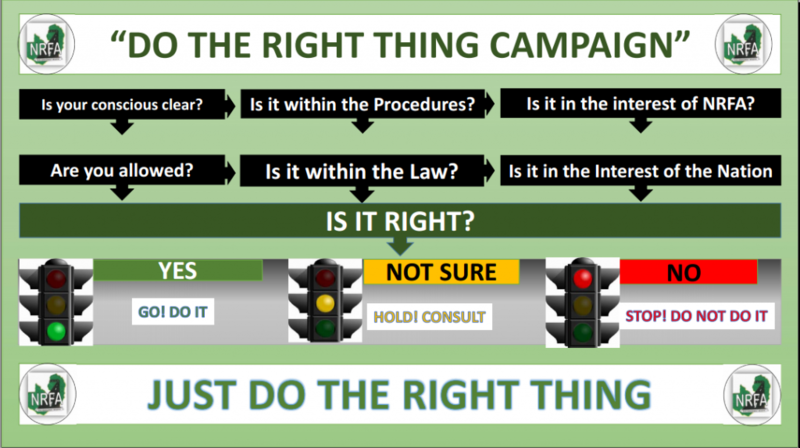 ‘Do The Right Thing’ Campaign is premised on customer-cenric orientation, that of keeping our stakeholders’ needs at the core of every decision, offering excellent service while putting in place improved, value for money processes and maintaining acceptable, high morals and integrity, in the execution of our duties. As an Agency mandate to manage and administer a huge financial envelope for the Road Sector, our launch of the ‘Do The Right Thing’ Campaign is in tandem with the Accountant General’s 2019 message which we have carried in this Newsletter. His message reminds us that we are at the core of prudent management of public resources. In this role, we are stewards of public finances and the citizens of our country trust that we will diligently exercise this duty, at all times. On our part, we have started the new year relishing the challenges that lie ahead. The huge demand for road infrastructure development to support the country’s economic expansion calls for a corresponding and immediate need for sustinable revenue streams and to account for these finances by Doing The Right Thing in line with the Public Finance Management Act No.1 of 2018. As we Do The Right Thing, we shall accelerate the pace at which we innovatively think outside the box and broaden the resource envelope through homegrown financing mechanisms, apply the resources in line with budgetary provisions and ensure Value for Money. I wish to conclude, by wishing all our stakeholders a wonderful and rewarding 2019 as we roll-up our sleeves to deliver on the vision of a Sustainable Road Fund.